Have you heard about the capsule wardrobe movement? While it’s surging in popularity now it’s actually been around for over twenty years. With a capsule wardrobe you focus on having a very small collection of carefully chosen clothes that can be intermixed to create different looks and outfits. Most capsule wardrobes have about 20-30 pieces. I’ve been toying with the idea of creating a capsule wardrobe for years now but with our upcoming move to England and the prospect of living with only the clothes I take on the airplane for the first couple of months, now seemed like a good time to take the plunge! 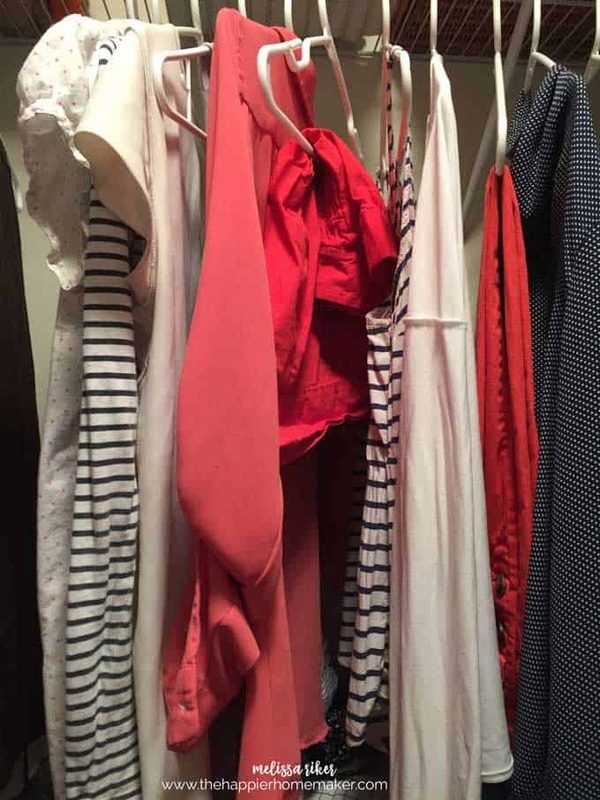 The first step to creating a capsule wardrobe is probably the hardest part-purging the closet!! 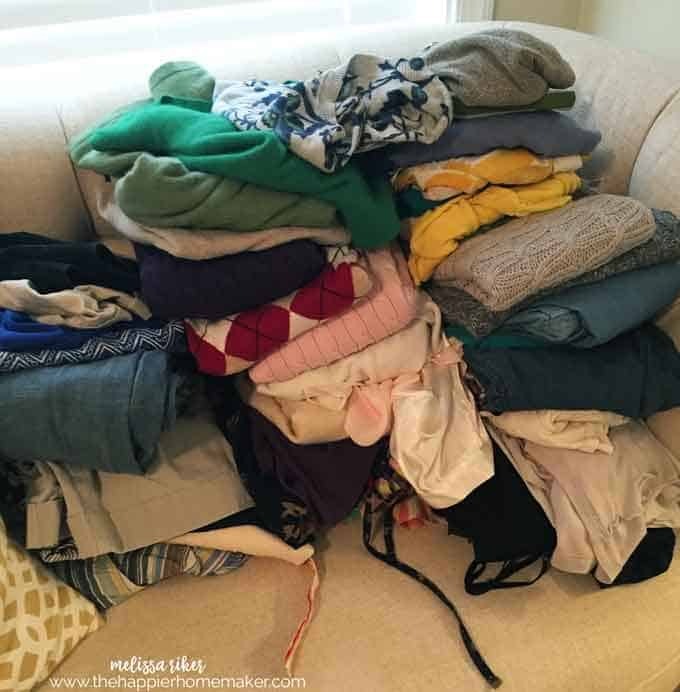 I have a bad habit of keeping clothes I never wear-even with the military moving us every couple of years I’ve been carrying around clothes for over ten years that I haven’ warn since having my oldest son! It’s ridiculous! Do I love this item? Do I feel good when wearing it? Is it in good condition, if not, can it be fixed? Separate your clothes into three piles-if you can answer yes to all three questions above, put it in your keep pile. If the clothes don’t fit or you don’t love them and they are in good condition put them in a donate pile. Items not in good condition need to head to the trash! The stack of clothes above was only about half of my donate pile when I went through my closet-it was a LOT!! Once you have your pile of clothes you love, that fit, and are in great condition put them back in your closet and really take a look at them. Notice any similarities or themes? Congratulations, you just found your person style! Obviously I love coral, pale neutrals, dots, and a good nautical stripe! I also prefer light, flowing fabrics and dresses and skirts over shorts. Knowing your personal style is unbelievably freeing-since doing this exercise and committing to a smaller wardrobe I’ve found it easier to shop for new clothes (don’t start hoarding again!) because I know if new items will work well for me and mix well with my current clothing. These are the main pieces of my current wardrobe, I do have a few more dresses and “flowy” tank tops not pictured (I would wear a dress everyday if left to my own devices-so comfy, flattering, and easy!) In addition to that I have a couple of cardigans to help me transition my clothes from the hot and humid weather here in DC to the much cooler temperatures at our new home in England. I’ll be taking three pairs of shoes-casual sandals, a pair of comfortable wedge heels, and some sneakers along with some simple accessories and a scarf or two. So, would you consider creating a capsule wardrobe for yourself? Be sure to follow along with me on Instagram and Facebook as so you can see how it’s working for me! I’ve actually been doing this for years without knowing it’s real name. I’ve always referred to it as Garanimals for Grownups!! The ragged jeans, leave at home or are you a teeny bopper? The short shorts, refer to above sentence. This isn’t a year round wardrobe, and like I mentioned it’s not everything, there are some items not pictured (like a raincoat!) I’m no teenager but I love those jeans and shorts-to each their own! Debbie, I love this post! Thank you for your always on point articles and recipes. Good luck on your move. Your email one I always look forward to and I have made so many of your recipes. I feel that Laura’s comment is a bit judgmental and a tad rude. Ripped jeans are a necessity to be fashion conscious. You are a young mom and I’m sure look fantastic and tasteful in your entire wardrobe. Thanks so much Denise, I appreciate the kind words! Thanks Julie! They are my comfy go-to jeans for playing with the kids and wearing around town! How about a good pair of rain boots…you will need them! I was told to buy those over there for a better price Jeanie! I’m excited to get a pair! Your clothes colors are so pretty, especially your coral! Where did you find your pretty red hangers?